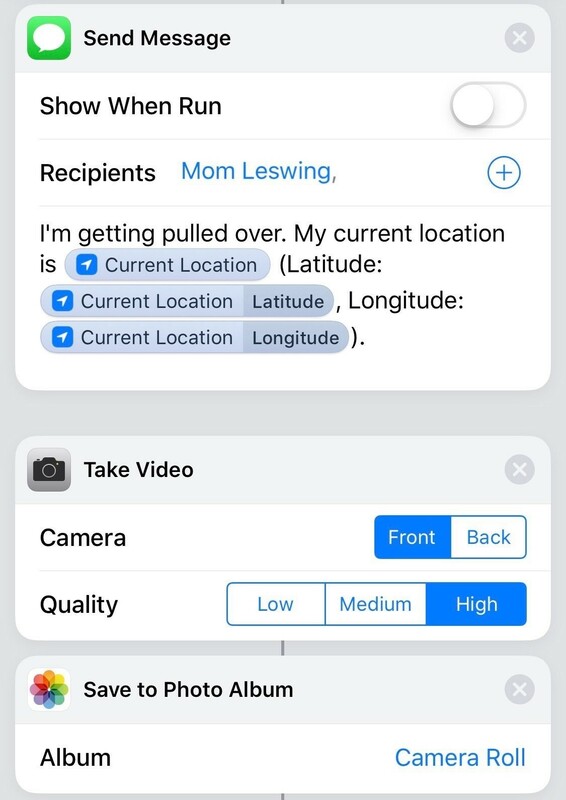 But Robert Petersen of Arizona has developed a more serious shortcut: It's called Police, and it monitors police interactions so you have a record of what happened. Once the shortcut is installed, you just have to say, "Hey Siri, I'm getting pulled over." Then the program pauses music you may be playing, turns down the brightness on the iPhone, and turns on "do not disturb" mode. It also sends a quick text to a predetermined contact to tell them you've been pulled over, and it starts recording using the iPhone's front-facing camera. Once you've stopped recording, it can text or email the video to a different predetermined contact and save it to Dropbox. "It seemed to me that if you're getting pulled over it couldn't hurt to have a recording of the incident," Petersen said in a direct message on Tuesday. "The police these days in many places have body cams, so this could be the civilian equivalent." How will driverless cars affect police forces? The idea of a hands-free mobile app for fraught interactions isn't new — since 2012, the American Civil Liberties Union and others have developed apps to record and livestream encounters with the police. While he didn't base the shortcut on existing apps, Petersen said he was inspired by projects by digital-rights groups like the Electronic Frontier Foundation. It's difficult to tell how many people have downloaded the shortcut, but it's the third-most-popular post of all time on the burgeoning subreddit dedicated to sharing shortcut recipes, and it's been widely covered in the Apple-enthusiast press. It's on version 1.4, and changes so far have focused on bug fixes and support for additional services, like iCloud Drive. Petersen said that most responses he'd received since posting the shortcut in September had been positive and that some people had told him they want to adapt it to different potentially dangerous situations. Some people "say they've had issues in the past with the police, and one woman planned on using the shortcut to help with a stalker issue she was having with an ex-boyfriend so that she could send her location to family quickly should anything occur," Petersen said. "That's one of the great things about Shortcuts: Anyone can edit a shortcut someone else has made to suit their specific needs," he continued. You can examine all the steps a shortcut takes and all the apps and services it uses — so you can be sure that the script isn't, say, uploading your data to a random server when you use a shortcut you didn't write. The entire recipe for the Police shortcut can be accessed in the Shortcuts app. Petersen said he didn't have a background in programming but knew enough to get around and had written scripts for macOS in the past. He added that he was an Apple fan and was surprised that the company had introduced this kind of feature for power users given its tendency to keep things simple and locked down. If you're interested in making your own shortcuts, Petersen has some advice. "The platform has a lot of potential, and if you read the Apple user guides and consult with others on forums, or just look at how other people's shortcuts work and 'reverse engineer' them to your own needs, you can learn a lot quickly," he said. You can download the Police shortcut here. Make sure you have the Shortcuts app installed.